Being the avid tomato lover that I am, it's pretty crazy that I just found out about this festival this year! 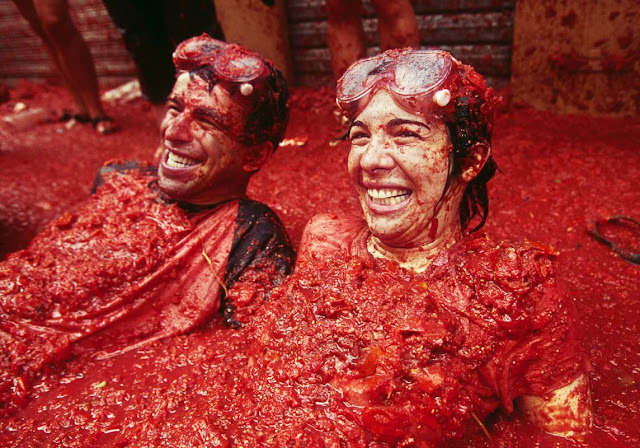 La Tomatina. Spain's Giant Tomato Fight festival! 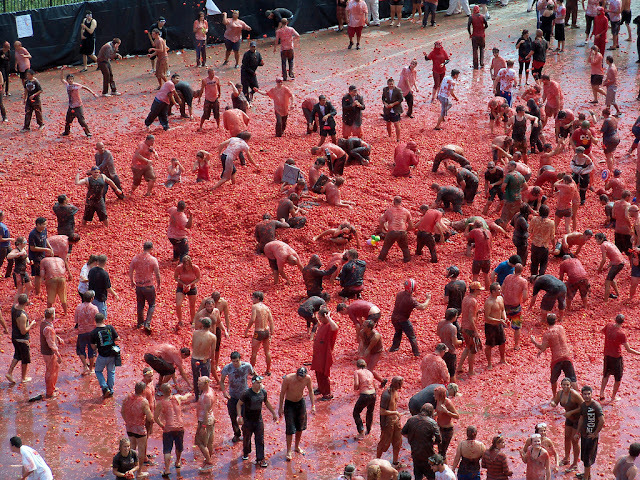 I am not sure whether to be outraged at the waste of so many tomatoes or amazed that Spain feels it has such a surplus that they can waste them by having a giant tomato food fight! My love of tomatoes is a border line obsession so this is basically like tomato heaven! However it is actually like a ketchup festival because they don't allow whole tomatoes for safety. This is definitely on my Must-Do list! There are now a few other places that have started having similar festivals like The Midwest Tomato Fest, but in true American Style, you have to pay to go. If you are in Spain, don't miss out. It happens the last Wednesday of August. Don't forget to wear cloths you don't mind throwing away and shoes with a grip- it's slippery. Bring cloths to change into so you don't dirty the public transport. The tomato acid will burn your eyes so wear goggles.